Genuine Datacard 806124-109 KrT Black ribbon with resin (K)black panel and the (T) panel is a thin, clear protective overlay. Prints 300 images per ribbon. Compatible with the following Datacard ID card printers. DatacardSelect Platinum, Magna Platinum, Magna with AIT, Select with AIT, Imagecard II,Imagecard II+, Imagecard III, Imagecard IV, Imagecard Express, ImagecardSelect, Imagecard Magna ID printer series. The Fargo 86214 YMCFKOK Color Ribbon consists of yellow (Y), magenta (M) and cyan (C) color panels for full spectrum printing using varying degrees of heat. The Black resin (K) panel is used for text and barcodes, and the (O) panel is an overlay to help protect the card. The second black (K) panel is for printing on the reverse side of the card. The Fluorescing (F) panel is used for printing single color artwork that fluoresces under Ultraviolet(Uv) Light. Fluorescing panels provide added protection against card duplication. The Fargo 86212 YMCFKO Color Ribbon consists of yellow (Y), magenta (M) and cyan (C) color panels for full spectrum printing using varying degrees of heat. The Black resin (K) panel is used for text and barcodes, and the (O) panel is an overlay to help protect the card. The second black (K) panel is for printing on the reverse side of the card. The Fargo 886204 Black Resin Ribbon is a Monochrome (single-color) ribbon.Monochrome ribbons are used primarily for line art, text and barcodes. Bar codes printed with this ribbon can be scanned by both infra-red and visible light bar code scanners. The Fargo 86202 YMCKK Color Ribbon consists of yellow (Y), magenta (M) and cyan (C) color panels for full spectrum printing using varying degrees of heat. The Black resin (K) panel is used for text and barcodes. The second black (K) panel is for printing on the reverse side of the card. The Fargo 86201 YMCKOK Color Ribbon consists of yellow (Y), magenta (M) and cyan (C) color panels for full spectrum printing using varying degrees of heat. The Black resin (K) panel is used for text and barcodes, and the (O) panel is an overlay to help protect the card. The second black (K) panel is for printing on the reverse side of the card. 81733 - YMCKO full colour with resin black and clear overlay panel. 250 Image ribbon. FARGO card printers require specialised Fargo ribbons to function properly. To maximise printed card quality and printer durability, use only genuine FARGO ribbons. Note: 81733 Fargo ribbons fit all Fargo C10, C11, C15, C16, C25, Pro-L, Pro-LX, Persona, Persona II, PersonaPlus, Cheetah, Cheetah II, Pro, 4250 and Quattro ID card printers. The Fargo 86200 YMCKO Color Ribbon consists of yellow (Y), magenta (M) and cyan (C) color panels for full spectrum printing using varying degrees of heat. The Black resin (K) panel is used for text and barcodes, and the (O) panel is an overlay to help protect the card. 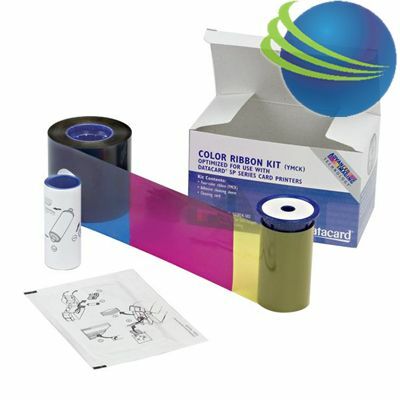 When used with the Sunlight K3 printer this full colour 250 print starter kit ribbon produces the highest quality thermal printed card on the market today. Bright colours and amazing definition on skin tones for ID cards. Prints high definition full colour images on one or both sides of a card. Ribbon includes tacky cleaning roller. When used with the Sunlight K3 printer this full colour 250 print refill ribbon produces the highest quality thermal printed card on the market today. Bright colours and amazing definition on skin tones for ID cards. Prints high definition full colour images on one or both sides of a card. Ribbon includes tacky cleaning roller. Prints the colour of the ribbon to one or both sides of a card. Use with plain white or coloured plastic cards to create cheap but fantastically effective loyalty, discount or membership cards. Gold & Silver ribbons are perfect for printing premium membership / loyalty cards. Sunlight K3 Monochrome Black (K) Ribbon. Sunlight K3 card printers require specialized Sunlight K3 ribbon to function properly. To maximize printed card quality and printer durability, use only genuine Sunlight K3 ribbons.